Brands were first used in ancient Egypt to identify ownership and pride of their livestock such as cattle, people of that time would know that Great mr TI would have the best cattle due to an outstanding alimentation and care with their livestock. Of course, in the open range, cattle could become mixed with those of another owner, and therefore it became necessary to establish some form of identification. From the excavation of a 26th Dynasty animal cemetery, we believe that one means of identifying ownership was to etch or mark the horns of cattle. 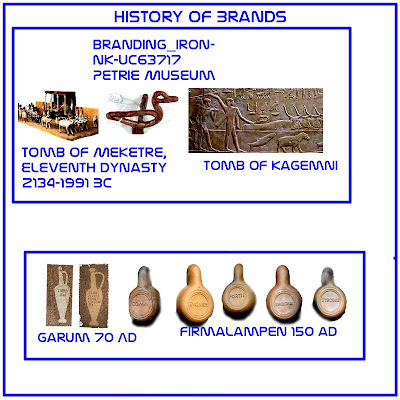 However, branding scenes are known from several Theban tombs (Nebamun and Neferhotep), as well as from the Varzy Papyrus, and branding was probably a more effective means of identification practiced by large estates and temples. Cattle were branded long before this; the term "maverick", originally meaning an unbranded calf, comes from Texas rancher Samuel Augustus Maverick who, following the American Civil War, decided that since all other cattle were branded, his would be identified by having no markings at all. Brands were used also to identify prisoners with symbols of dishonor or to mark a slave. Every numeral and letter of the alphabet can be made with a hot iron shaped in a “J”configuration. 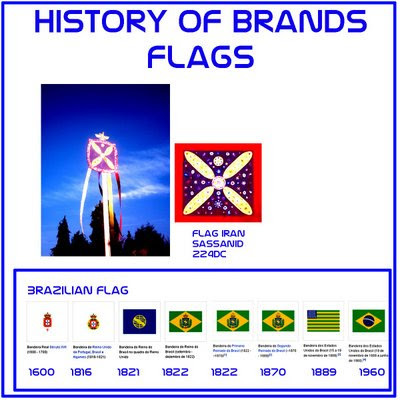 Flags was also a form of branding, the usage of flags spread from India and China, where they were almost certainly invented, to neighboring Burma, Siam, and southeastern Asia. The Persians used Drafsch e Kavian as the flag, at the time of Achaemenian dynasty at 550–330 B.C. Afterwards it was used in different look by the late Sassanid era (224-651). It was also representative of the Sassanid state - Ērānshāhr, the "Kingdom of Iran" - and may so be considered to have been the first "national flag" of Iran. 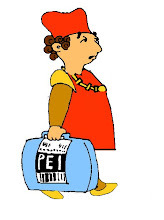 But the first time a brand was used to identify a manufactured product was in Rome. Some time ago was found in ancient Roman dumping in Modena vases, bottles and bricks, and oil lamps, each bearing their maker’s name. Firmalampen, or “factory lamps,” were one of the first mass-produced goods in Roman times (circa 150 A.D.). They carried brand names clearly stamped on their clay bottoms. It was founded also vast quantities of different qualities of Garum, likewise called liquamen, is a type of fish sauce condiment that was popular in Ancient Roman society. (such as the marketing puns of the "Vesuvinum" wine jars found at Pompeii).There were also the scandinavian sword (XI c.) with the handle made in bronze commonly ornamented by imaging of monster (like on Runes Rock). 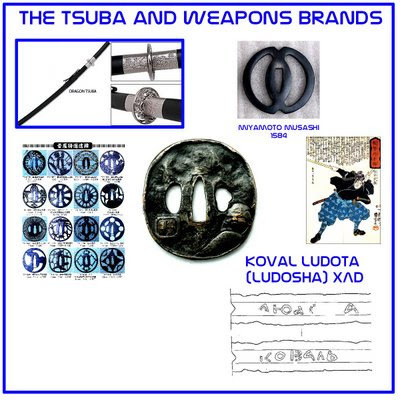 with a brand (trade mark) on the blade: “Kоваль Людота (Людоша )” (“Koval Ludota (Ludosha)”), translated like “Blacksmith Ludota (Ludosha)”.This is the most ancient weapon with cyrillic brand. The brand of the first ukrainian swordmaking blacksmith. 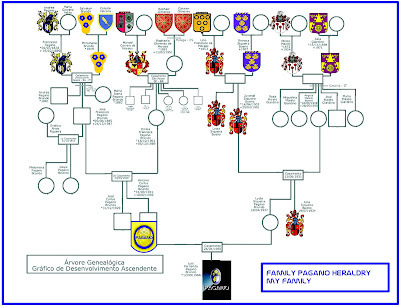 The usage of Family Blazons in medieval times to distinct a family from the others highlighting its main characteristics is used till today as a form to differentiate products (families) happened at same time in Japan with the Tsubas. Nicolas Appert (November 17, 1749 - June 3, 1841), born in Châlons en Champagne was the French inventor of airtight food preservation. Appert, known as the "father of canning," was a confectioner. 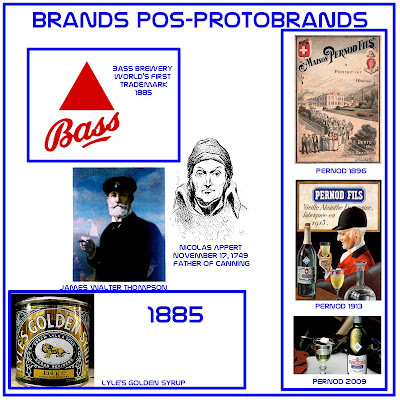 Those are earlier examples which could be deemed "protobrands" or brands tha came before industrial revolution and mass-production and subsequently mass-marketing. 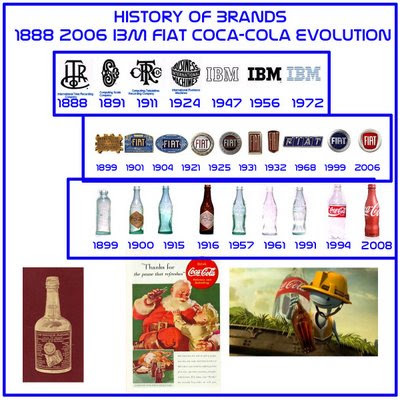 Brands in the field of mass-marketing originated in the 19th century with the advent of packaged goods. Industrialization moved the production of many household items, such as soap, from local communities to centralized factories. When shipping their items, the factories would literally brand their logo or insignia on the barrels used, extending the meaning of "brand" to that of trademark. Around 1900, James Walter Thompson published a house ad explaining trademark advertising. This was an early commercial explanation of what we now know as branding. 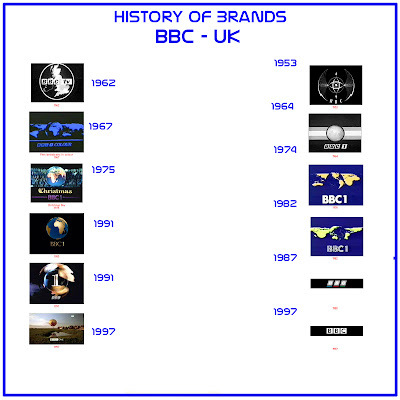 Companies such as Coca cola, IBM, Fiat soon adopted slogans, mascots, and jingles which began to appear on radio and early television. Well, speaking of the Coca-cola … marketers use to say that the world has changed since the very first Coca cola bottle was sold in Jacobs’ Pharmacy Atlanta, Georgia on may 8th 1866. The name and the product itself have lots of different meanings to hundreds of millions of consumers around the globe. Coca-Cola products are served more than 705 million times every day, quenching the thirsts of consumers in more than 200 countries and territories around the world. 1886 - Sales of Coca-Cola averaged nine drinks per day. That first year, Dr. Pemberton sold 25 gallons of syrup, shipped in bright red wooden kegs. Red has been a distinctive color associated with the No. 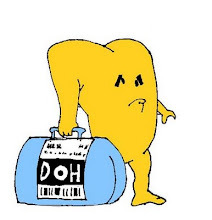 1 soft drink brand ever since. 1891 - Atlanta entrepreneur Asa G. Candler had acquired complete ownership of the Coca-Cola business. Pemberton was forced to sell because he was in a state of poor health and was in debt. He had paid $76.96 for advertising, but he only made $50.00 in profits. Candler acquired the whole company for $2,300. Within four years, Candler's merchandising flair helped expand consumption of Coca-Cola to every state and territory. 1893 - In January "Coca-Cola" was registered in the U.S. Patent office..
1917 - 3 Million Coke's sold per day. "" is the worlds most recognized trademark. 1925 - 6 Million Coke's sold per day. 1927 - The first Coca-Cola radio advertisement. 1934 - Johnny Weissmuller, and Olympic champion swimmer, and Maureen O'Sullivan, a motion-picture star, appeared on a metal serving tray for Coca-Cola. 1940 - Coke is bottled in over 40 countries. 1950 - Advertising on on the television began. Currently Coca-Cola is advertised on over five hundred TV channels around the world. 1971 - The song "I'd like to Buy the World a Coke" was released. 1982 - Diet Coke was introduced in July. 1988 - Coca-Cola was the first independent operator in the Soviet Union. 1993 - Coca-Cola exceeds 10 Billion cases sold worldwide. 1993 - Advertising slogan -"Always Coca-Cola". 1995 - Coke was consumed aboard the Space Shuttle Discovery -- marking the third trip into space for Coca-Cola and the first for Diet Coke. 1996 - The Summer Olympics will be held in Atlanta, Georgia, the home of Coca-Cola. For more than 65 years, Coca-Cola has been a sponsor of the Olympics.